Nobody I played with is celebrating a birthday today, but I wanted to remember my Yankee teammate Bill Robinson, who passed away too young in 2007 after battling diabetes. Weaser would have been 72 today. I saw him for the first time in 1965 in a Florida Instructional League game when he was a Braves prospect and we played each other in West Palm Beach. I wrote in my book that I had never seen a player who looked as good as Bill did on the field. We became friends after the Yankees traded a legend, Clete Boyer, to Atlanta for Bill and a pitcher named Chi-Chi Olivo, who had played a couple of years in the majors, but was assigned to Syracuse. I never played against Weaser, because the Yankees were the only American League team he had ever played for. He won the James P. Dawson Memorial Award for the outstanding Yankee rookie in spring training. The reporters who covered the Yankee beat would vote every year. In 1967, Weaser got the votes of all but one reporter, who preferred Thad Tillotson. He got a gold watch. He was a good hitter and an exceptional man, and I miss him. After writing about the Clete Boyer-for-Bill Robinson trade I started thinking about Chi-Chi Olivo, the other player in that deal. 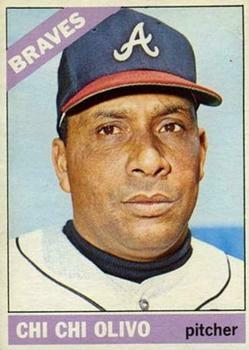 I knew Chi-Chi pitched for the Braves in the early 1960’s and his brother, Diomedes, was a pitcher for the Pirates because I followed pitchers closely in those days. 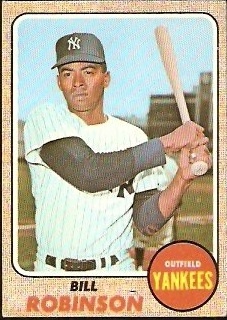 Soon after the 1966 season ended, Chi-Chi was in an automobile accident and received a serious head injury. The trade happened about a month later. I met Chi-Chi at spring training, but never got to know him well. I remember the day he got cut, along with Joe Verbanic and Mike Ferraro. He was assigned to Syracuse and never made it back to the majors. Sadly, Chi-Chi passed away of liver disease in 1977 at age 48; Diomedes died of a heart attack a few months later.